All our hand spray bidet models below are manufactured from high quality chrome plated brass. All external and internal parts are metal. This is an important factor in enabling them to handle the high pressure water supply that many Australians experience in their homes. They have been tested to over 1500 KPA and have Australian standards approval. 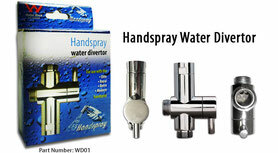 All of these bidet hand spray models are manufactured with high quality chrome plated brass. In addition, all the internal parts are metal, which is an important reason that they are able to handle the high water pressure that many Australians experience in their homes. They have been tested to over 1500kpa and all carry the Australian standards approval. The Handspray bidet water divertor tap has been specially designed to fit under your cistern. As a unique safety feature the lever needs to be turned down to operate the handspray and up to fill the cistern. Please look at the positions description of the hand spray water divertor tap before using it. Thus ensuring the user always turns it off. This dual check is probably the best quality bidet dual check on the market today - where most dual check are only tested to 700KPA, this dual check holds a safety rating of 1200KPA. The water pressures in most areas in Australia are higher than the rest of the world . 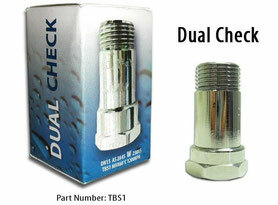 That's why this dual check been tested to over 1500KPA, thus ensuring your peace of mind that the dual check you purchase is going to do the job you purchased it for. This dual check been submitted for testing and hold relevant approval certificates. The ultimate Pressure Reducing Valve slim line design. 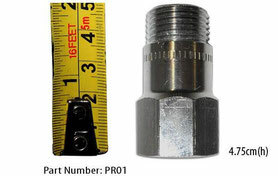 Most pressure limiting valves on the market are large and bulky items. This pressure limiting valve is small and has an ergonomic design, you won't even notice it's there. 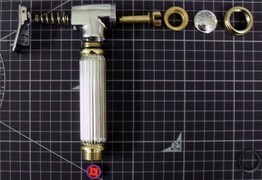 Please specify your hand piece style upon order : Retro handspray bidet, Modern handspray bidet or Royal handspray bidet. The Elite handspray bidet has been discontinued. We offer three handspray bidet installation kits for you to choose from with your choice of hand spray. If you are purchasing a new handspray bidet to replace an existing spray. If the pressure exceed's 350 kpa you need to install a pressure reducing valve included in this kit.